BACKGROUND AND PURPOSE: Findings of blood oxygen level–dependent (BOLD) functional MR (fMR) imaging of the cervical spinal cord, obtained by using a fist-clenching motor task, have been sporadically reported. Because spinal activation by sensory stimuli has a potential at least equal to that of fist clenching, its feasibility was assessed. Whether stimulation of the median nerve could evoke an fMR imaging response at 1.5 T in the cervical spinal cord was investigated, and the response pattern was compared with that obtained by fist clenching. METHODS: A dynamic cardiac-gated T2*-weighted imaging sequence was used to quantify cervical spinal cord activation under two paradigms with different numbers of subjects. Seven subjects underwent electrical median nerve stimulation at the elbow sufficient to elicit a maximal compound muscle action potential in the flexor carpi radialis muscle. Eleven subjects performed self-paced fist clenching. Cord activation was measured in the sagittal and transverse imaging planes. RESULTS: In the sagittal view, five of seven subjects had an fMR imaging response in the lower cervical spinal cord upon median nerve stimulation, whereas seven of 11 subjects showed activation with the fist-clenching task. Within the cord, the measured fMR imaging response level was approximately 8–15% with respect to the baseline signal level. In the transverse imaging plane, significant fMR imaging responses could be measured in only two of six and six of nine subjects with median nerve stimulation or fist clenching, respectively. A consistent cross-sectional localization of the activity measured in the spinal cord was not detected, either in terms of the right and left sides or in terms of the posterior and anterior directions. CONCLUSION: In the sagittal plane, median nerve stimulation at the elbow can evoke an fMR imaging response in the lower cervical spinal cord. The activation pattern was comparable with that obtained by fist clenching. The localization of the segmental fMR imaging activation (C4 through T1) is consistent with the known functional neuroanatomy for both paradigms. In the transverse plane, reliable fMR imaging responses were obtained much less frequently, and assignment of distinct areas of the spinal cord to the stimulation methods used was not possible. Functional MR (fMR) imaging with blood oxygen level–dependent (BOLD) contrast is proving to be a powerful research tool for the study of local neuronal activation related to motor, sensory, and cognitive tasks in the human brain. Increases in neuronal metabolism and, hence, oxygen consumption cause an enhanced local cerebral blood volume and oxyhemoglobin concentration. Consequently, the relative amount of paramagnetic deoxyhemoglobin decreases, which in turn leads to a lower T2* relaxation rate, and is measurable with BOLD-sensitive MR imaging. When spinal cord neurons are activated, hemodynamic effects, comparable to those in the brain, may be initiated. Motor tasks activate motor neurons in the anterior horns of the spinal cord gray matter. Sensory input produces a more diversified response, with different sensory paths forming synapses in different locations. Only two previous groups of investigators have described fMR imaging responses within the spinal cord. Both studies involved a motor task in which one of the hands had to be closed and opened (fist clenching) repetitively in a 1.5-T (1) or 3-T (2) MR imaging system. 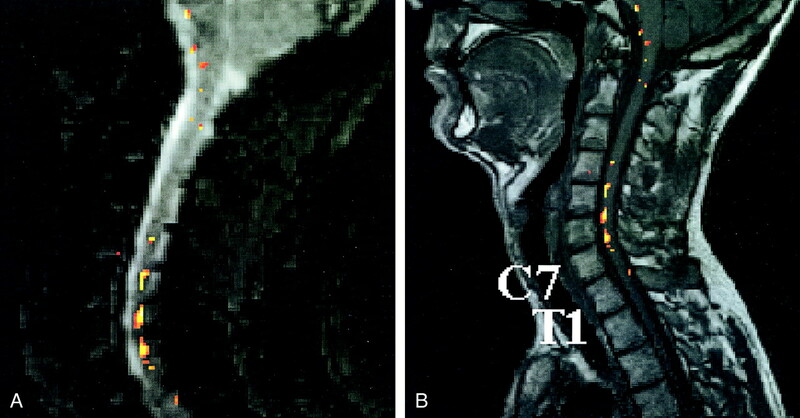 Both studies revealed ipsilateral and contralateral fMR imaging responses near the seventh cervical spinal cord segment owing to the BOLD effect. Obtaining fMR imaging responses from the spinal cord involves considerable technical difficulties. For instance, the small cross-sectional area of the spine, the effects of respiratory motion, and the presence of pulsatile cardiac-related movements of the cord itself as well as the surrounding CSF can severely degrade the quality of MR images. To minimize respiratory motion artifacts, Stroman et al (2) used an MR imaging acquisition time course in which the subjects were instructed to breathe between image acquisitions and to hold their breath during the acquisitions. Functional MR imaging of the spinal cord by using electrical stimulation of a peripheral nerve has a potential clinical application at least as great as that using a motor task. The study of abnormal activation of the cord upon stimulation in patients with chronic pain syndromes is an obvious example. The use of a median nerve stimulation paradigm has the advantage that the intensity of the stimulation does not depend on the subject's efforts and physical abilities, in contrast to a hand-exercise task. The intensity of median nerve stimulation can, moreover, be accurately controlled by external measurements. Accordingly, we set out to study the feasibility of cervical spinal cord fMR imaging using cardiac-gated image acquisitions in a clinical environment with electrical stimulation of the median nerve, and we compared the results with those obtained with a fist-clenching task. Eleven healthy volunteers (nine men, two women; age range, 20–33 years) without histories of neurologic or psychiatric disease were recruited from personnel employed at our institution. Informed consent was obtained in all cases. Only right-handed subjects were selected. An experienced neuroradiologist (J.T.W.) studied the anatomic MR images of the subjects to exclude individuals with any abnormality of the spinal cord or spinal canal. Eleven subjects performed a fist-clenching task. They were instructed to clench and unclench either their left or right hand to maximally extend and flex their fingers. The frequency of opening and closing the hands was approximately 1 Hz. Resting and activation were alternated in 30-s epochs, repeated four to five times. Left- and right-hand clenching tasks also were alternated. Four subjects performed only the fist-clenching task. These individuals were the first to be examined, when electrical stimulation was not yet available. Therefore, electrical simulation of the median nerve also was performed in the last seven subjects. The median nerve was stimulated repetitively at the elbow with 0.2-ms constant current pulses at a frequency of 1 Hz. The stimulation current (20–40 mA) was adjusted to induce a maximal compound muscle action potential as measured with a standard electromyographic device placed over the belly of the flexor carpi radialis muscle. The compound muscle action potential could be recorded for all subjects inside the MR imaging room during the experiments (Fig 1). The electrical stimulation resulted in clearly visible movement of the hand (flexion and pronation) as well as the fingers. Also, the subjects reported paresthesia in the area innervated by the median nerve. All electrical stimulations and measurements were performed with superficial carbon electrodes suitable for use in a high–magnetic field environment. Electrical median nerve stimulation was applied in 30-s epochs alternating with 30-s epochs without stimulation (rest). Left- and right-hand stimulations were alternated. This sequence also was repeated four to five times. Images were acquired with a 1.5-T MR imaging system that was equipped with a standard receiver neck coil. Head fixation was achieved with two foam cushions. The MR imager room was dimly lit, and the subjects were instructed to close their eyes during the experiment. On the basis of T1-weighted survey images obtained in three orthogonal directions, all cervical segments could be identified, and the midline sagittal image through the center of the cervical cord was selected. This sagittal section was used to position the sagittal and transverse sections for the subsequent fMR imaging sessions. The stack of transverse sections was centered on the C6 and C7 vertebrae, near which activation is expected on the basis of functional neuroanatomy. The functional imaging session for the sagittal images consisted of a multishot (ie, segmented in k space) single-section T2*-sensitive echo-planar imaging sequence with the following parameters: 68/50 (TR/TE); flip angle, 15°; section thickness, 8 mm; matrix, 128 × 128; and field of view, 250 mm. For the imaging session in which four transverse images were acquired, the parameters were as follows: 100/50; flip angle, 30°; section thickness, 5 mm; matrix, 256 × 256; and field of view, 250 mm. The time course of the acquisition of the functional images was gated by the heartbeat signal to reduce artifacts related to cardiac function. The gating parameters were as follows: R-R interval window, 10%; gate delay, 250 ms; and gate width, 500 ms. The fMR imaging signal is based on the BOLD effect (3, 4). Before the acquisition of an fMR image series, two dummy images were acquired to run the system in a steady state to avoid switch-on effects of the magnetic relaxation processes in the tissues. The total acquisition time was about 13 min for each paradigm. The entire fMR imaging experiment (including the instructions to the subject, checks on stimulation currents, image acquisitions, and reconstructions) lasted, at most, 1.5 h per subject. Possible image artifacts due to the current leads were avoided by stretching the stimulation cables as much as possible and by using nonmagnetic carbon electrodes. Immediately after the initial survey image was acquired, a few rapid T2*-weighted images were acquired to check for electrical stimulation artifacts. For anatomic reference, two T1-weighted multisection spin-echo images in the two orientations were acquired. For the sagittal view, the acquisition parameters were as follows: 500/20; flip angle, 90°; sections, 12; section thickness, 3.0 mm; matrix, 256 × 256; and field of view, 250. The parameters for the transverse view were as follows: 550/17; flip angle, 90°; sections, 15; section thickness, 5.0 mm; matrix, 256 × 256; and field of view, 250 mm. A rectangular presaturation region was positioned parallel and anterior to the cervical cord for the functional as well as the anatomic images to reduce motion artifacts caused by breathing and swallowing. For the fMR images, the time course of the MR signal was modelled for each voxel by using a baseline level and 6-s-delayed hemodynamic boxcar functions, which had different amplitudes during the epoch conditions without stimulation and with left- and right-sided stimulation (Fig 2). Low-frequency drifts were removed from the fMR imaging signal time course by a set of cosine basis functions with a maximum frequency of 1/120 Hz. 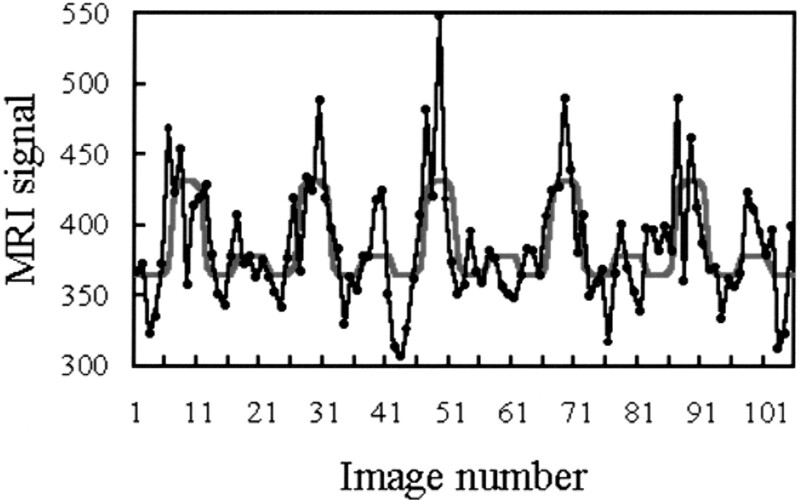 The fMR imaging signal time course was temporally smoothed with a 2.8-s gaussian kernel. The postprocessing scheme did not contain a motion-correction algorithm. Only those voxels that passed an analysis of variance test (P < .05) for the validity of the model for the fMR imaging signal were considered. Moreover, to eliminate voxels outside the cord, the pixel value had to be at least equal to 0.8 times the mean pixel value of the functional image. The statistical significance of the amplitude values in the considered voxels was assessed by using an analysis of covariates test, the results of which were superimposed as statistical Z values on top of the anatomic images as statistical parametric maps. These calculations (5) were performed with the SPM96 software package (Wellcome Department of Cognitive Neurology, London, England) implemented in MATLAB (The MathWorks Inc, Natick, MA). Table 1 contains an overview of the results with both paradigms. The number of subjects showing significant fMR imaging responses in the cervical spinal cord is shown. The checks on the stimulation currents and the acquisition of a useful electrocardiogram proved so time-consuming that not all the planned acquisitions could be conducted in all subjects. Table 2 shows the level of the cervical spinal cord exhibiting fMR imaging activation as shown by the sagittal section acquisitions. Figure 3 illustrates a typical example of the fMR imaging activation pattern with electrical stimulation. The activation pattern is superimposed on one of the functional images and the anatomic image. Inside the cord, signal changes maximally reached 15% of the baseline level but were typically 8–12%. MR imaging signal intensity time courses that correlated positively with both paradigms also were found around the cord, probably reflecting the BOLD effects of the large veins on the surface of the cord. These signals showed amplitudes of as much as 25% compared with the baseline signal. Distinctions between dorsal and ventral activations could not reliably be made in the sagittal view. The activation found in the transverse view was usually bilateral for each hand and mostly located at or over the cord surface (Fig 4). The image quality in the transverse plane was much lower than that in the sagittal plane. Transverse images in the lower cervical cord acquired during fMR imaging sessions. A, fMR imaging responses evoked predominantly within the cord as well as on the cord surface during the fist-clenching task. In the human cervical spinal cord, MR imaging signal changes due to the BOLD effect could be demonstrated for an electrical median nerve stimulation paradigm as well as a fist-clenching task. Sagittal views showed that the fMR imaging responses were located between the spinal cord levels C4 and T1. The segmental pattern of activity in the lower cervical spinal cord as caused by electrical stimulation of the median nerve at the elbow is likely related to segmental neuronal activity. The relatively high current stimuli applied at the elbow presumably evoked, in an unspecific manner, all sensory and motor fibers in the median nerve, which could almost all contribute to neuronal activity on the mentioned cervical segments. Only the dorsal-column medial lemniscal system does not form synapses after the sensory information has entered the spinal cord (6, 7). Since the neuronal activity is likely to be distributed over posterior and anterior regions of the spinal cord, a selective activation of the posterior or anterior horn, which we did not find, could not be expected with the stimulation parameters used. Additionally, the hand and forearm movement induced by the stimuli is prone to evoke rather unspecific spinal cord activation. 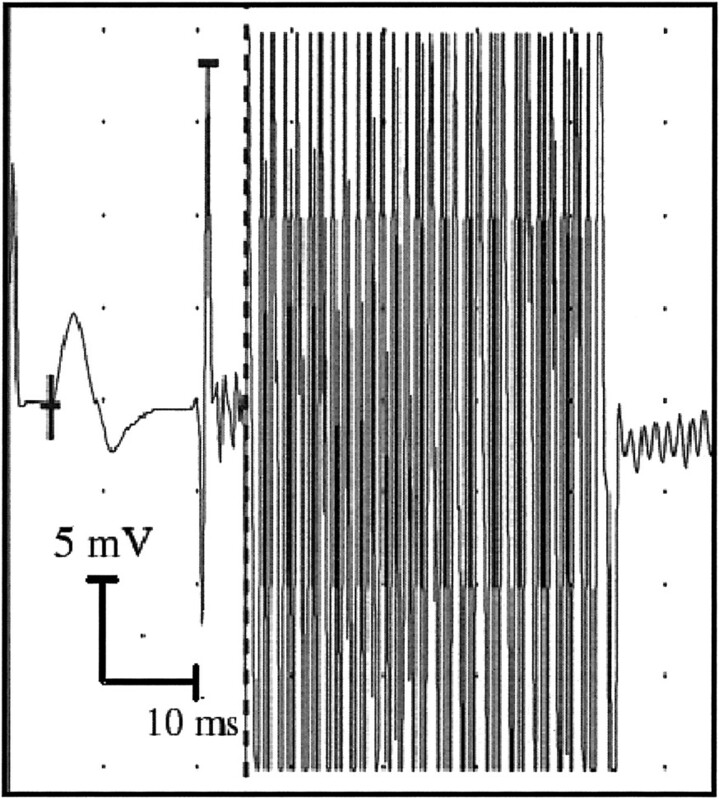 On the other hand, a presumably right-sided response could be expected, despite the rather unspecific stimulation, because the vast majority of sensory fibers entering the spinal cord do not form synapses on the contralateral side, and the retrograde excitation of the motor fibers also is likely to stimulate ipsilateral spinal cord neurons. The motor task also involves both motor and sensory neurons in the cervical spinal cord, because fist clenching inevitably evokes sensory feedback. Therefore, this task theoretically should induce ipsilateral activity distributed over the whole spinal cord segment. Owing to the inferior information from the transverse images, however, we were not able to demonstrate any laterality, as Yoshizawa et al (1) described, in either experiment. Because the metabolic demands of the soma of the neuron are known to be higher than those of the axons or dendrites, we can assume that an fMR imaging response is evoked in relation to the gray matter. This response explains the typical pattern of activation that completely conforms to the well-known levels of median nerve spinal cord input. Rather, if the axons were a major source of fMR imaging activity, we would encounter continuous activity throughout the lower cervical spinal cord. We delivered a suprathreshold stimulus to the median nerve and, hence, evoked action potentials in a variety of nerve fibers. This unspecific manner of stimulation is likely to give rise to input in all sensory systems in the spinal cord. These encompass the dorsal-column medial lemniscal system and the spinothalamic tract. The latter typically involves ipsilateral spinal cord neurons at the level of sensory input. The dorsal-column system forms synapses at the lower brain stem level, but interneurons at the level of entry being activated also exist. Additionally, activation of spinocerebellar fibers can be assumed. These give rise to activity of ipsilateral spinal neurons, both anteriorly and posteriorly at the level of entry. Therefore, the sensory input is likely to evoke activity of a variety of neurons located in the posterior and anterior horn of the spinal cord gray matter on the ipsilateral side. Furthermore, it can be assumed that motor fibers were activated in a retrograde manner. Thus, it is also likely that the ipsilateral alpha motoneurons in the anterior horn were involved in the spinal cord response measured. A confounding variable that should be mentioned, with respect to the localization capabilities, is that draining veins are frequently the origin of relatively large BOLD signals in fMR imaging experiments. In particular, those veins located at the surface of the cord can contribute to the BOLD signal modulations. Such draining veins are spatially correlated to the location of neuronal activity to only a limited extent. Comparing the motor task results of a 1.5-T study with those of a 3.0-T study (2) reveals differences with respect to the maximum amplitude changes of the BOLD signal. Stroman et al (2) found a maximum signal change of 8.5%, whereas our highest increase was approximately 15%. Only considering the main magnetic field, one would expect lower signal changes at 1.5 T than at 3.0 T (5). A possible explanation is the relatively long echo time applied in our study. Stroman et al (2) used an echo time of 30 ms, whereas we used 50 ms. Brain fMR imaging studies (8) have revealed that the fMR imaging signal changes in vessels can almost be doubled when echo time is increased from 30 to 50 ms at 1.5 T. Yoshizawa et al (1) found a maximum signal increase of 7% at a field strength of 1.5 T and a lower echo time of 40 ms. Our typical signal changes of 8–12% are comparable. In their fMR imaging brain activation study (8), Gati and colleagues found that BOLD signal changes in vessels can rise above 20%. Accordingly, the relatively high signal changes of up to 25% around the spinal cord, as observed in our study, could have originated from large veins. However, it is also possible that the BOLD effects in the brain and spine are different. Flow or pulsations of CSF around the cord seem an unlikely cause of the large signal changes. These cannot be expected to appear in the same time patterns when the electrical stimulation or fist clenching was performed. Motion effects of the CSF could not explain why the fMR imaging responses observed in the sagittal view were restricted to specific cervical spinal cord levels but would appear throughout the entire spinal cord or unspecific cord levels. Possible presaturation effects due to inflowing or outflowing CSF also cannot completely explain the activation pattern found in the transverse view. After all, when a CSF peak velocity of 30 mm/s is assumed (9), the magnetic spins can move 3 mm at most, which is only a fraction of the section thickness (5 mm), with a repetition time of 100 ms. Therefore, most of the CSF passes somewhat through the section and probably enhances the measured MR imaging signal to some extent. But this inflow of unsaturated CSF or blood is not the exclusive cause of the localized MR imaging signal changes. However, this might be one of the reasons that the quality of the transverse images was lower than that of the sagittal images and that the fMR imaging responses from the areas surrounding the cord on the transverse images could not be pointed out as reliable BOLD effects. With the applied technique, the imaging performance in the transverse plane was inferior compared with that in the sagittal plane. One reason for this might be that the smaller voxel sizes for the transverse acquisitions are more sensitive to BOLD signal–disturbing motion effects. Another reason is the lower signal-to-noise ratio for smaller voxels. With the transverse acquisition technique applied in this study, the spatial localization ability remains restricted to the identification of cervical or thoracic spinal cord levels. To achieve more detailed localization distinctions between functionally different areas within the spinal cord, improved techniques are needed. In the future, the use of specially designed neck coils for data acquisition, a high-field-strength MR imaging system, and flow-suppression pulse sequences will allow us to topographically examine, in the intact human being, the activation pattern of the spinal cord in the transverse plane. Conventional MR imaging of the spinal cord has produced great benefits in terms of rapid, noninvasive, and accurate imaging of cord morphology. The standard MR imaging examination, supplemented by MR myelographic sequences, has virtually supplanted conventional myelography and CT myelography for cord and root imaging. Spinal MR angiography is being developed to a point of eventual equivalence with conventional spinal angiography. Diffusion MR imaging potentially provides information about the orientation of cord fiber tracts and the viability of cell membranes. Functional MR imaging now makes it possible to study the effects of motor tasks and sensory input on the hemodynamics of the spinal cord and, by inference, on cord neuronal activation. The results of the present feasibility study on sensory cord activation are promising, but it is clear that follow-up studies will have to involve more physiologic stimuli than the maximal electrical median nerve stimulus we used. Tactile stimulation of the index finger has been shown to produce an fMR imaging response in the cerebral cortex comparable to that caused by electrical stimulation of the median nerve. Activation patterns produced by tactile stimulation and the sensory paths in the spinal cord, brain stem, and cerebrum potentially can be registered with this technique. Applications directly affecting patient care, similar to presurgical cortical mapping with fMR imaging of the brain, are not easily foreseen at this time for cord fMR imaging. The technique could, however, have the potential to demonstrate abnormal cord activation by non-noxious stimuli, which occurs in conditions such as reflex dystrophy, and it could also be useful in elucidating other chronic pain syndromes. The findings of this preliminary study demonstrate that cervical spinal cord fMR imaging at 1.5 T using the BOLD contrast mechanism is feasible in humans. MR imaging signal intensity changes that correlated with the time course of the paradigms were found in cervical spinal cord segments C4 through T1 for an electrical median nerve stimulation paradigm and a fist-clenching exercise. Artifacts, particularly those induced by motion remain a concern, and techniques to minimize them for BOLD imaging must be found in the future. Nevertheless, the observation of segmental fMR imaging activation in the human spinal cord should enable further MR imaging research of the neuronal functions located in the spine and its interactions with the brain. 1 Address reprint requests to Walter Backes, Department of Radiology, University Hospital Maastricht, P.O. Box 5800, 6202 AZ Maastricht, the Netherlands. Accepted after revision May 15, 2001.